It's a total process, a total investment decision that will yield benefits in proportion to the extent it's well thought out. The AMD-powered server platform, with its blending of a design intended to enhance virtualization efforts and unique software and hardware partnerships, delivers a true breakthrough for virtualization and the cloud. High core density can translate into a greater number of VMs per physical machine. Coupled with unique power management capabilities, the result can be a more cost effective and high performing virtualization and cloud solution. Innovative connections with system management tools make it possible to manage and scale your AMD-based virtualization solution cost effectively no matter how complex your business requirements might be. 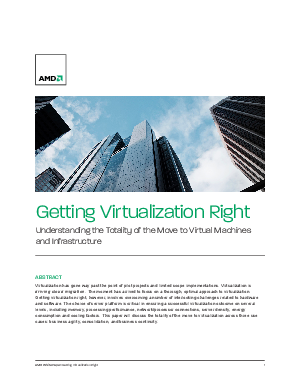 Download this whitepaper to learn more about the move to virtual machines and infrastructure.